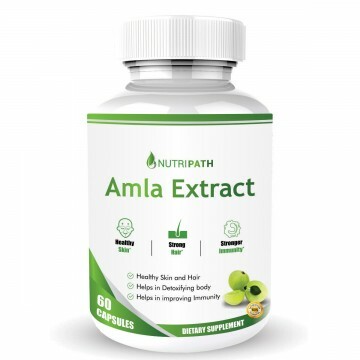 Amla Extract is herbal and 100% safe to consume for its pure ingredient. Nutripath Amla Extract improves immunity, digestion, and detoxification. It prevents cold & cough. Amla Extract also improves skin & hair. Amla or Indian Gooseberry is one of the fruits that grown in the lower Himalaya in a pristine environment. In the traditional medicines, Amla has been used extensively for its various health beneficial properties. Many researches have done to evaluate the effectiveness of this fruit. It has shown that amla extract is enriched with vitamin C and keeps us healthy owing to its rejuvenation, antioxidant, and anti-inflammatory properties. Nowadays, many nutritionists suggest to include Amla Extract to include in our diet plans. Most of us now suffer from cold, cough and fever. Due to the enriched source of vitamin C, Amla is capable to provide from common cold and cough. Apart from it, Indian Gooseberry is also popular for increasing our immunity system to protect us from different diseases and their harmful effects. From strengthening your immune system to improve the skin and hair texture, Amla Extract does it all. This fruit not only keeps one away from common cold but also improve digestion, flushes out toxins, and lose weight naturally without any side effects.